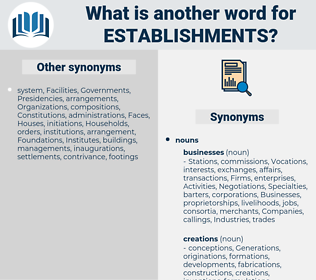 What is another word for establishments? Academies, Penitentiaries, homes, stores, outlets, utilities. locations, holdings, UNICS, systems, shelters, SMES, platforms, Firms, homes, Workshops, projects, Houses, shops, Workplaces, etablissements, NGOS, venues, units. organisational, instituciones, environment, HEIS, system, chemical, nhris, alberta, etablissements, community, template, republic, EMIS, headcount, SBSTA, Manning, Operators, judiciary, NGOS, corps, Bretton, downsizing, b.c., jurisdiction, september, industry, natural, federally, venues, warden, owners, high, land, iaea, grid, cis, canadian, trade, eurosystem, non-bank, CFI, pieces, established, review, Du, public, may, building. administrations, Appointments, amenities, mills, chains, arrangements, conditions, Investments, years, requirements, Assemblies, times, infrastructures, Instrumentalities, instruments, prepares, restaurants, segments, departments, means, instances, headquarters, tenants, Occupations, components, purposes, complement, locations, Environments, holdings, banks, rates, applicants, Households, residents, installs, ministries, commissariats, corrections, inmates, Branches, plantings, entidades, chambers, Slaughterhouses, hostels, Habitats, commissions, flats, occasions, Respondents, flexfields, Students, Societies, systems, jobs, memorandum, Hospitals, museums, agents, 'entreprises, machines, inspection, inspections, Incubators, shelters, positions, numbers, Undertakings, assets, Stations, WEBSITES, bedspaces, Nurseries, bars, confines, entreprises, findings, Charities, stalls, detainees, rooms, kindergartens, SMES, Laboratories, Missions, presences, estates, hotels, Colonies, campuses, sales, clinics, MALLS, courses, massages, boards, endeavours, parks, seats, centros, ventures, Trainings, annexes, Dormitories, data, appliances, Communities, trends, retailers, farmlands, Beverages, occupancies, jurisdictions, principals, troops, buildings, supermarkets, counterparts, contributors, groupings, preschools, Bureaus, Apparatuses, Worksites, dwellings, internees, conurbations, Families, frameworks, organisers, SOES, precincts, KES, Industries, professions, services, needs, patrols, Villas, organizers, eateries, Universities, contractors, suppliers, organisms, spots, fabrics, devices, levels, licensees, empresas, localities, sets, Ones, hubs, relays, Subsidiaries, Activities, individuals, lessees, Forums, winners, Adults, items, months, ranks, Forms, arcades, media, platforms, teachers, jails, grounds, Factories, entrepreneurs, clubs, statistics, discharges, audiences, Carriers, outposts, educators, Firms, SPAS, Arenas, resorts, Prisons, seasons, visitors, circles, Workshops, visits, orders, ranches, Nurses, customers, Dependencies, projects, trades, Persons, checks, Cells, Houses, offenders, NODES, players, Vendors, herds, Programs, processors, Areas, farmers, Children, CAMPS, Parties, cases, PUBS, shops, cores, summary, Databases, desks, producers, Pupils, vessels, flocks, employers, abstract, Beds, spaces, Workplaces, farms, uses, offices, actors, yards, Bases, exchanges, features, backgrounds, academics, patterns, development, developments, fluxes, doors, wards, targets, products, functions, compounds, problems, Properties, flows, scenes, complexes, types, Drives, drinks, instituciones, Operators, NGOS, venues, owners, pieces, Created, start-ups. establish, Establishing, unit, units, setting, settings, settlement, settlements, preparation. 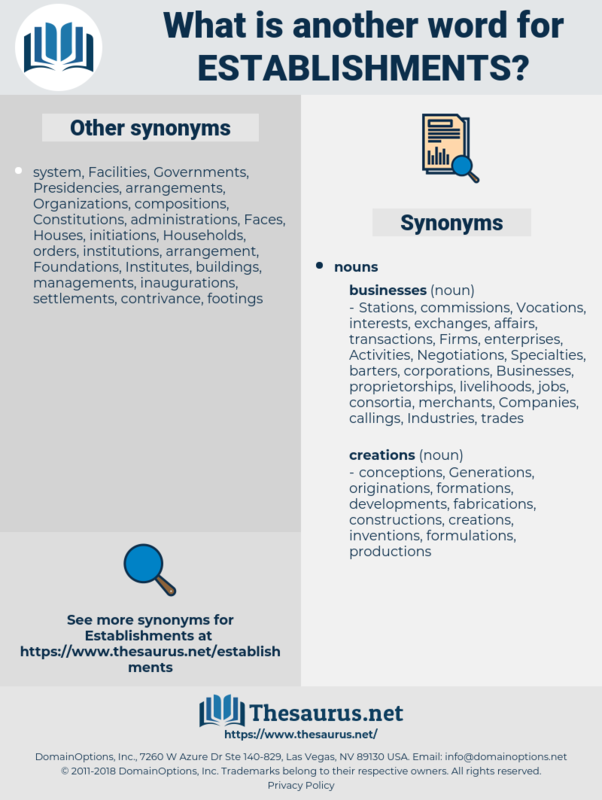 deployments, sectors, guesthouses, configurations, residences, Constituencies, parlors, workforces, establish, Establishing, constitution, Constitutions, preparations, settings, settlements, preparation. Neither of these houses ever recovered from the effects of the visitation; they were eventually absorbed in other monastic establishments. The reverses of Rome by sea were a second time the cause of her giving up her naval establishments, and she sold her marine equipments to the dealers in marine stores, at a ruinous sacrifice.